Going Nutty! : Dibel, Dibel, Dumpling....Are you a Dibler? It's Benchmark time again! With the Veteran's Day holiday and the staff development on Monday we have exactly three days to Benchmark #2 our entire class! ORF comes in this time along with Retell, so it will take a little longer. I have 3 wonderful volunteers who graciously help during BMs and PMs. Phoneme Segmentation Fluency falls off for us this time. But starts for K...so I am passing down my "Counting Creatures" so that by the time they get to me next year, it will be a breeze! I made ten of these to use in small group. They slide them on and I show a word card. They say all the sounds they hear while counting those sounds with the "Counting Creatures". And then they hold up how many there were. If the card were a cat, they would hold up the three fingers. (Because even though we taught them word families in K, -at has to be two separate sounds to get credit for them on the test)! I used them during RTI for two weeks after the BM and also put some in center...and now when they write- they are using the invisible counting creatures to make sure they are writing at least one letter for every sound they hear. They were super easy to make. The Dollar tree has packs of gloves 2 and 3 pairs...they are the little stretchy ones. This may be the most important part of the post. 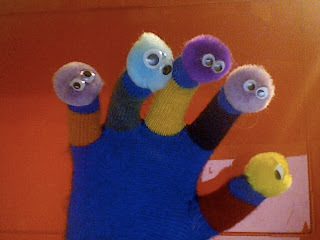 When hot gluing the pom pom to the glove- insert a pencil inside of the finger do not put your finger in there! Hope you like my Counting Creatures! Loving the counting creatures! Thanks for the idea! GIrl! This is a fantastic idea!! I love it!! Can't wait to make some!